We believe in attention and retention, and we care about the relationships and the results we can achieve for our clients. 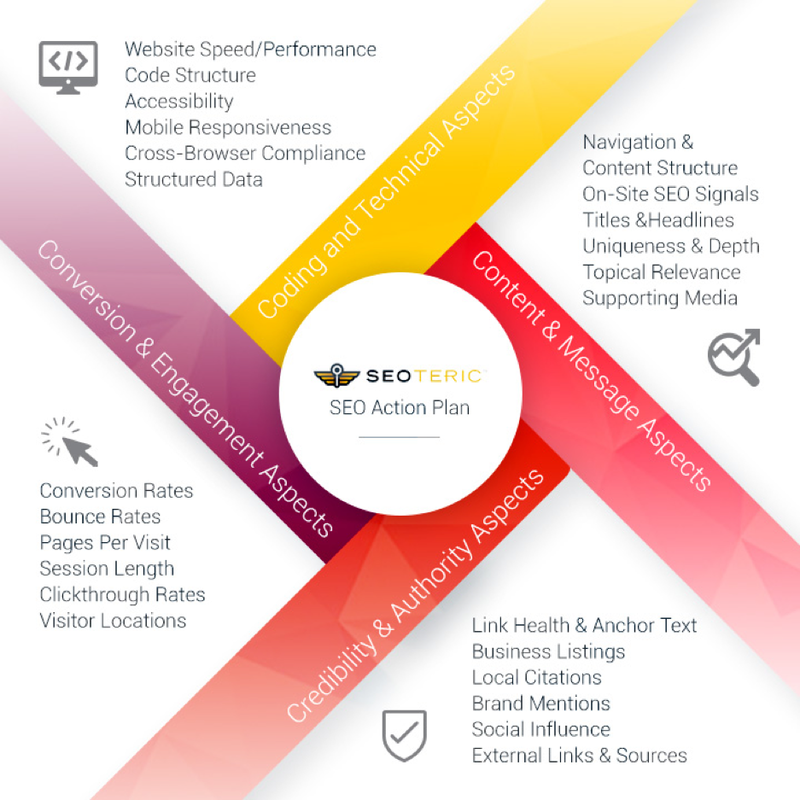 You are about to make a decision that will have a big impact on your overall marketing success and business growth, so we would like to introduce a few things about SEOteric that make us as a great choice to handle your digital marketing. We believe in attention and retention, and we care about the relationships and the results we can achieve for our clients. We have an internal customer dashboard that helps us know how each client is doing and how we need to engage to get optimum results. These dashboards track each client’s improvements, leads, traffic increases, and other important metrics so we can see how we are performing for each client. Our account managers keep an eye on this dashboard and become your advocates to keep those numbers improving. This is a snapshot of our Client Health Dashboard. We track the response time and the resolution time when support tickets are submitted. We know that our response time is indicative of attention and care, so we make sure to put response time and resolution time as priorities for our clients. We measure and track these stats in real time. Our industry average for response time is 22.5 hours. We usually run between 12 and 16 hours average response time, which includes nights, weekends and holidays. Our resolution time also beats our industry benchmarks of just over 2 days. We also like to keep the number of support tickets low. When we build a solution or implement a strategy, it has been tested and we know it works, and that means less support tickets are entered. A company of our size typically has 150+ tickets per month. We have about 1/5 of the amount of tickets submitted on average. Our team takes great pride in creating and providing solutions that work without issues. This is a snapshot from our operations dashboard that tracks response time, resolution time, industry benchmarks, and support ticket volume. Many of our competitors don’t track these types of statistics, but they are an important measure of how we interact with our clients. We outline our strategies in the SEO Action Plan section. In that section we include the things that we need to influence to get the results we want for our clients. The approach is multi-faceted and covers technical aspects, content, credibility, and conversion strategies. We don’t take shortcuts or cut corners, but we manage the things that will move the dial in a positive way and have longer lasting value. Our reporting is industry-leading, as we provide weekly web-based interactive reports that measure the things that we are influencing such as keyword positions, organic landing pages, visitor locations, engagement and conversion metrics, domain authority, website speed and performance, and many other factors. We also provide quick tips on what each metric means, as well as a video tutorial on what each item means and why it is important. This gives you access to a wealth of data where you can see the impact of your SEO services. We don’t lock our clients into long-term contracts. We offer a month-to-month agreement. This keeps us engaged to perform month after month as opposed to a year long commitment. We have a 95%+ retention rate, and you can see some of our case studies on our website at http://www.seoteric.com/case-studies/. We want you to know that we are always engaged and working for you, and the weekly reports help us show that. We use BaseCamp to manage our SEO projects, and it is a great utility to store important information and share ideas, discussions, files, and project related items. You can assign multiple people to a project, and set your notifications to include you on updates and project status. There are multiple people on our team assigned to each project so we know it is getting the attention it needs. SEOteric is a full service marketing agency, which means we have graphic artists, code developers, systems engineers, SEO consultants, and marketing specialists who are specialized and trained to meet whatever needs our clients have when it comes to digital marketing. When needs arise, we are equipped to handle them, and we can expand and grow with you as your business grows.